I was at my local oriental grocery store and they had some beautiful rainbow trout for sale. I have smoked salmon before, but I wanted to smoke trout on the Big Green Egg. Top Down view of the trout. See the nice, buttery meat just ready to be eaten? I love the seafood selection at the Lotte in northern Virginia. I feel like a kid in a candy store! 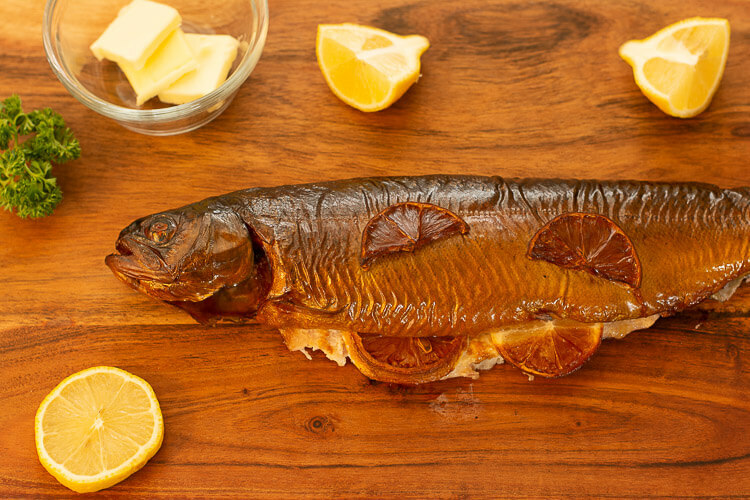 Ginny was out of town, so this was the perfect opportunity to try a smoked trout recipe. The gentleman behind the counter was kind enough to rinse the fish and packaged it up nicely. I got home and made a brine. This was about one gallon of water, one cup of brown sugar and one cup of kosher salt. I mixed them together well to dissolve and placed the fish in the container to soak for about 6 hours in the refrigerator. Before bedtime, I took the fish out of the brine and laid them on a tray normally used for cooling cookies (don’t tell Ginny!). I covered it with Press-N-Seal and set it back in the fridge overnight. 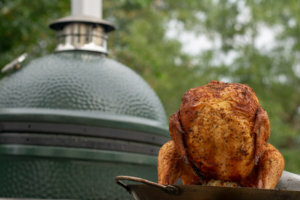 I woke early in the morning to get the Big Green Egg going. It was well south of 32 degrees outside, so I was a bit worried that I would have to free the lid from being frozen shut, but I got lucky and it opened just fine. There was just a little bit of charcoal left in the bottom from my last grilling, but as this recipe calls for very low smoking temperature, I dropped in my homemade firestarter and let the grill heat up. I had some extra alder left over from my last trip to Dizzy Pig and started to soak it in a bucket of water. Next time, I would like to try some fruitwood. I bet that nice, mild smoke would complement the fish nicely. After about 30 minutes, the charcoal was burning nicely. I placed the plate setter and grating on the BGE, and closed the top and bottom vents to less than ¼”. After another ten minutes, the temperature was stabilized and it was time to put the fish on the grill. I kept one of the whole trout plain. I added three pads of butter and a couple of lemon slices to the body cavity and added another couple of slices of lemon on top. Lemon and Butter for one trout. Just the brine for the second trout. Right before I put the fish on the grill, I added the smoking chips to the BGE. Using the grate tool, I lifted the plate setter slightly and dropped in about half of the wood chips. No problem. Set them directly on the grate. The skin may stick a bit when you remove it, but it isn’t a big deal, as the meat will flake off easily. In hindsight, I could have used olive oil on the grating to minimize the chances of it sticking. I kept an eye on the temperature and made sure it stayed less than 225 degrees. That can be a bit of a challenge with the plate setter in there. It will continue to heat up and can cause problems later in the cook. If it does start to get too hot, add a disposable pan filled with ice cubes between the grate and the plate setter. Try to close the vents a bit more too. With about an hour left in the smoke, I added rest of the smoking chips. 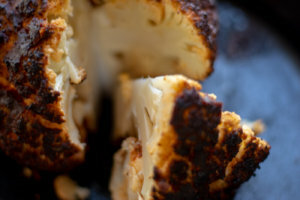 Unlike many foods, I wasn’t too worried about it becoming too smoky, as the outside skin would collect most of the smoke flavor, but it is later discarded. 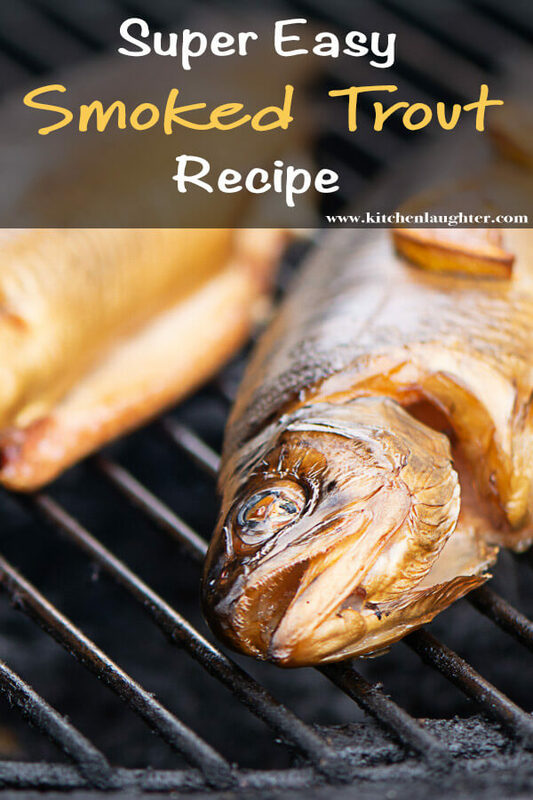 I smoked it until the temperature of the fish reached over 160 degrees. This took about 3.5 hours, but the amount of time will vary significantly, so keep checking the temperature. As expected, when it was time to take them off, the skin stuck to the grate a little. Not a big deal. A little coaxing and I removed the fish to the tray to cool. 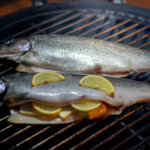 The smoke from the BGE is doing its job with the trout! 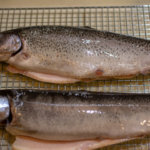 After the trout cools, it is time to pick the meat. Trout are very bony fish. The best way I found to remove the meat while minimizing the number of bones was to peel the skin of the fish up from the belly to the dorsal fin (on top). There is a very nice filet of meat there. 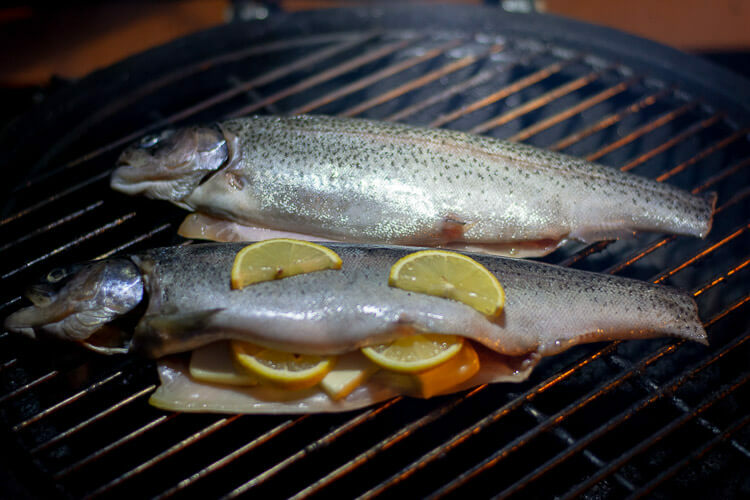 The spine is about ½” below the top of the fish, so use your finger to pull the meat away from above the spine. You’ll quickly feel the bones. After the top meat is removed on one side of the fish, you should see the exposed spine. Using your fingers again, slowly peel the filet below the spine, down towards the belly. With any luck, the bones stay attached to the spine, and meat comes off easily. With one side of the fish cleaned of meat, hold the tail in place and gently lift up on the spine from the tail to the head. Do it gently, so the spine and all the bones lift up. That leaves the filet easy to remove from the other side of the fish. I can almost guarantee you’ll still get a few bones in the meat, but I definitely had a lot fewer on the second fish I tried. I was extremely surprised how mild and tender the smoked trout was. 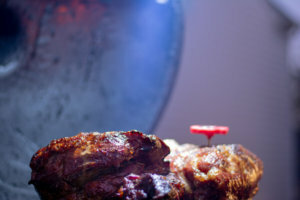 The heavy smoke smell of the skin became a mild, well-balanced flavor of the meat. 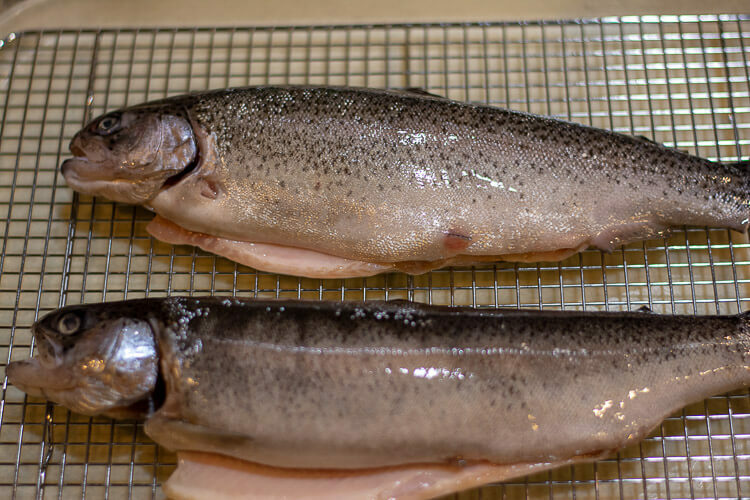 The trout meat can be eaten warmed or cooled. You have to love that! I had some crackers, cream cheese and a bit of the smoked trout. Oh my! Was that tasty! 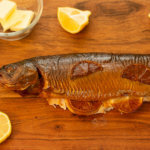 What Do I Do With Smoked Trout? As you can imagine, Ginny is excited about coming home to make something out of my efforts. I just give and give here! Make your favorite salad (when greens aren’t being recalled!!) and lay a few slices of the smoked trout on top of the bed of greens. Mix together a couple tablespoons of softened butter with a tablespoon of chopped fresh dill in your mini food processor to create a nice spread for sandwiches or on crackers. Make a delicious smoked trout dip using ½ cup of softened cream cheese, ½ cup of plain yogurt (greek or otherwise) 1-2 tablespoons of chives and 1 cup of smoked trout. Mix cream cheese, yogurt, and chives together in the mini processor. Hand mix the trout with the mixture to keep the larger pieces. If you don’t care, throw them in with the mini processor with the cream cheese mixture. If you want to mix it up a bit more, you can add the zest of one lemon. Another variation is to add 1-2 minced garlic cloves. You just want a little zip from those not an overpowering taste of the garlic. Create a nice bagel with softened cream cheese and lay a couple of slices of the smoked trout on top like you would lox. We have also seen people do a simple bread/cracker with avocado and the smoked fish. Three ingredients and that’s it. The big one that I’m anxious to try is to make a “grown-up” macaroni and cheese with the trout using fontina and gruyere cheeses. Gently mix in the fish before baking off so you still have those nice pieces in each bite!! The options are really endless but at least you have a great idea of where to start! 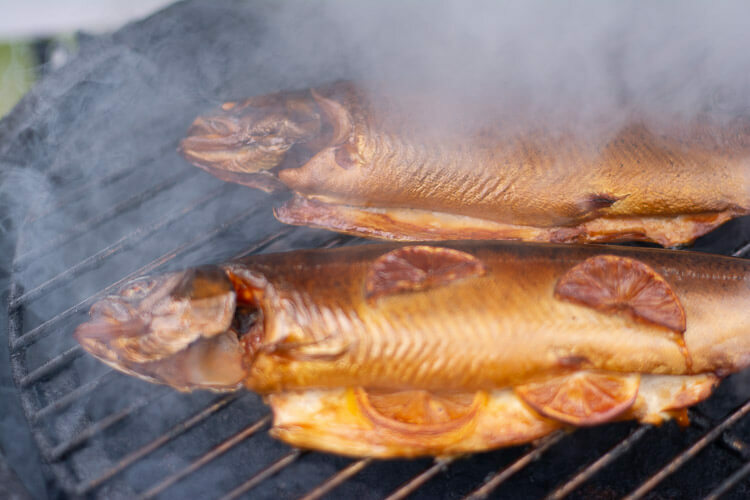 Here’s hoping you like smoking fish as much as we do! Combine the salt, brown sugar and water and stir until there is no sediment at the bottom. Add the trout to the water and cover. Add the fish to the grate. On one fish, I added lemon and butter. 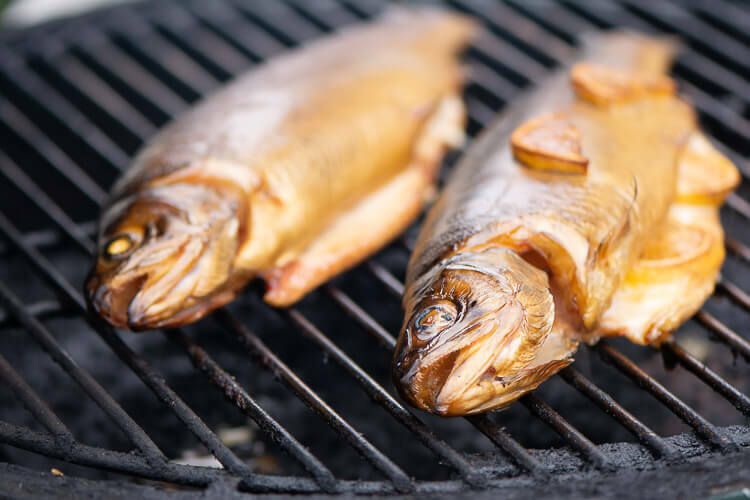 Let the fish smoke until the internal temperature is 160 degrees. It took me a little over 3 hours. Remove the fish, let cool, and debone. It’s time to serve! 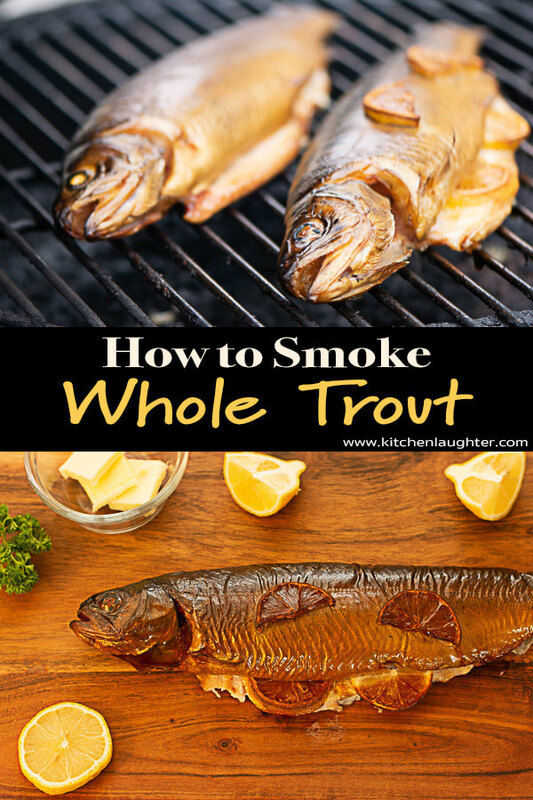 Just a few East Steps to Smoke a Whole Trout.